Register Log In Piano World Home Page Forums Piano Tuner-Technicians Forum Did Kimball ever make good pianos? I'm guessing you mean "sold" at the factory outlet...my understanding (correct me guys if I'm wrong) is that they are imported from Asia, no? I've seen a few in the field of recent build, and they're pretty nice actually, for the money. 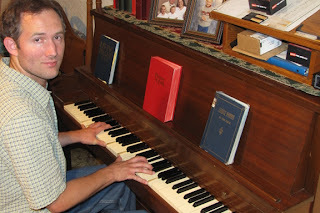 It is not without some great joy that I note that in recent years the PTG Journal has begun to feature technicians like Chuck Behm, who celebrates older historical/heirloom pianos...I truly believe the value of his work-saving these older pianos and encouraging others to take that approach as well-cannot be overstated! There is a good way to avoid unwanted tunings which is to ask when the last one have been done. Very clear tone, sounding at first as a can full of nails, but in the end while too little low partials and density for my liking, I understood the kind of tone it had, was really Ok for some Jazz or church playing and not so difficult to tune than I expected. not much "finesse" (heavily loaded soundboard and hard hammers) but the scaling was not that bad probably. No need to hate any piano, (I keep in mind that the piano is part of the family of the customer, it helps) but we have all our own limits. I have tuned quite a few Kimballs. The Whitney and the Kimbalette were nightmares to tune. The Kimballette would never stay in tune, even if you tuned it at A435! The piano always fought itself when you tuned it. Another problem was the brass jack springs! Given them 5-10 years and you had to replace them. The touch was as if you had to pound the piano to play it due to the angle of the keys and the action position! The sound left alot to be desired! The worst was the small Kimball La Petete baby grand, the key desk would bow from book weight! Thank heavens they quit building them! Nothin like a Good Piano! Funny, I have tuned more than quite a few Kimball pianos but have never heard of a Kimbalette or a La Petete. I have also never encountered the above mentioned problems. Just before Christmas, I was called to a palatial home in an exclusive area to tune a Kimball La Petite grand. I had no problem at all with it and the lady of the house was gracious and tipped me generously over my usual fee. Thank heavens they built that piano! I loved it! The lady received a referral from the concert hall in her town where I have taken care of the Steinway Model D, having restrung it and replaced its action some 20 years ago. Nothing like loving all pianos you service! You have to hand it to Kimball for creativity: "Artist Console," (to paint the provebial lipstick-on-a-piano), or their "Consolette" for not quite a console. Or "Mezzo-thermoneal stablizer." That one always cracks me up for hype. The Gold Rope too. AND those partical board cases, and grand tops that weigh a ton. Their small grand actions are a bit bizarre with such dinky parts. Some of those old Kimball uprights had lovely oak cases with plaster "carving" on the front that would disolve in the stripping tank. Bummer. Also never liked their brass damper flanges. They are a pain. I had a Kimball player grand that had some type of plaster work on the tops of the legs. Like you stated it melted with the stripper, I caught this as I was stripping the legs and quickly washed them down with water to stop the process. It seemed like it was plaster of Paris or something like that....not real plaster. The unusual damper flanges in the older uprights is that what you are referring to? I have two La Petite grands in my practice here...one in an upscale nursing facility, and one in a beautiful church. I regulated the action in the nursing home and repaired the piano after one of the staff rolled it too quickly and snapped off the leg (! )...and its a light weight, well playing piano. The La Petite in the church needs work...I'd rate them as "ok" instruments...but they really benefit from regulation, i.e. I find them less forgiving of excessive hammer stroke or friction...fwiw. Wow! I'm amazed at the rave reviews I'm reading of the Kimball LaPetite grands! (well, unless I misunderstood :p) In my opinion, though, their tone generally leaves a LOT to be desired, ESPECIALLY in the bass! I'd rather hear a Baldwin Acrosonic than any LaPetites I've ever played. One particular one I played at a retirement home my grandma lived in at the time was absolutely NO MATCH for my 57" 1913 upright, in spite of its having completely worn hammers almost down to the molding (with grooves deeper than the thickness of the strings)! Now, if someone knows of a LaPetite with a bass that would run circles around a fully-rebuilt (INCLUDING new soundboard, and whatever else would be replaced when doing a rebuild that extensive) turn-of-the-19th-to-20th-century full-size upright, I'd like to know about it. You can right-click my avatar for an option to view a larger version. The stores were not supposed to sell LaPetite grands - they were priced to get the customer in the store, where the salesman was supposed to convince the customer to buy a more expensive instrument. I remember them priced at $1999, then $2599, then $2999. The price might have hit $3999 before production ended, but I don't remember exactly. Given the price point, the quality is better than some. Last edited by Bob; 01/02/10 05:17 PM. Yes, Dan, the removable brass spring loaded flange that would crack at the screw. Pain to install. Seemed like the oak case, plaster carving and brass flanges ran togther. Plus 3/4 plate with that birds eye maple veneering on the top of the block that would crack and look terrible. Block would look like it was shot thru with cracks but be just fine. I find it so strange so many piano technicians have so much different opinions on Kimball pianos. What is wrong? The piano or the technicians? This case should be unanimous. In my 35 years experience, I have yet to find a "decent" Kimball. Even one vienese edition I had to service for a music college was a "real" joke. The hammer rail completely split in half and cost the college $1000CAD in the 80s to fix! Must I give note to this community that Kimball's relation with Bosendörfer was because Kimball bought Bosendörfer because they where in a bad situation. Thank god, Yamaha bought it (Bosendörfer) recently. I think it is a good match. So, Kimball is one of the worst piano ever. I never suggested any clients of mine to purchase one. Stay away from them I would tell them. And guest what? Will I invest the same amount of work on a bad piano has on a good one? No. Why? Because I will work harder on the bad piano to make it sound at its best. It can take two hours to tune it but it will be 100% of its capabilities. As I wrote earlier on this post, I'm passionate about pianos and would never compromise because the piano is a piece of junk. When I finish with it, it will behave. Come on guys! A bad piano IS a bad piano. If we piano tuner-tech can not make the difference, who will? How can any customer have faith in you as a tech if you can't make any difference between a good and a bad piano? How good will that be for your client? Do you think you are helping your client by "being polite"? People hire us because we are *specialists*, they din't invite us to a cocktail party! They have to rely on someone no? They have faith in you, respect that. I have a big passion tuning piano and servicing them and I LOVE pianos because I'm a pianist but I ate a bad piano, why not? The sophisticated lady to whom you tell her piano is *ok* when it is not, do you really think she will believe you when you tell her when *another* piano is very good even if it is? People are not that dum. Stop treating your clients like if they where children or retarded, it is not respectful for them. Sorry but I (will) stand by my opinion no matter how bad you write back to me and I know you will. Last edited by Mario Bruneau; 01/06/10 01:47 AM. I'm am in agreement with Mario in that sometimes a bad piano IS a bad piano. Like any other produce in any other market you have to call a spade a "spade". However, I also agree with Bob Bremmer in that if you approach any servicing with the idea that the piano is crap you'll never service your customer the way you ought to. It's up to the technician to give it the best work they can. The customer is expecting that. And unless they're really into this stuff, most people don't really have any clue as to how good (or bad) their piano is, especially if it's like an old family heirloom or something, and they are expecting that when a tuner comes into service it then they're going to get it back to sounding like it belongs on the concert stage. If their piano is less than great then you should give them reasonable expectations about what the final results should be. Customers will be much more cool with that than a tech who gives it only a half-assed job and makes them feel like they're being jipped. I'm only an amatuer in this area but I know that in customer service you're paid to give the best service to your customer that you can. They're expecting you to offer it regardless of how good their hardware is. In a post in this thread on 12/30 you'd mentioned Cable in with Whitney, kimball, etc. I know that it's not super great, but I thought that Cable made a very decent instrument in their day. I've got a 5' from 1929 and it seems very sound. Has anybody had an experience with this brand from that pre-depression age, and can they give me any honest opinions of them (not that RPD's is wrong or dishonest)? I just have no other experiences to go by. Pre Depression pianos from many makers were better than their efforts in the 50's to 80's. Aeolian bought up many good names and quality suffered in some of those starting about 1960. Post depression, it depends who made the Cable = Aeolian built Cables were not as good as Cable made Cables. I like Everett made Cables the best. Mine is from The Cable Company, Chicago, from the late 20's. I've seen Hobart M Cable, Conover Cable, and Cable & Sons though. As I understand, Aeolian bought them in the mid 30's along with several others and ran them all into the ground. The older Chicago ones were good quality, but time has taken its toll. The French Lickers were not so good. Hey, buddy! My sister worked for Kimball there finishing cabinets, so watch it. Like you, I have seen some junk Kimballs. However, working for a Kimball dealer from 1974-1988 I encountered some very stable units as well. The dealer sold around 80 pianos per year before a fire destroyed his business. I still service alot of those pianos today. I was at the factory several times for seminars. Kimball never claimed to be the best piano, just the best piano for the money. Sorry it has taken me awhile to get back to this topic. For the record, I never insult my clients by telling them their piano is crap. I don't care who they are or what they paid for the piano or how bad it is. Especially now... the economy in Michigan is at an all-time low, unemployment is at an all-time high. I am grateful for every piano I tune. If they ask, I will tell them what the issues are from a purely technical point of view or if they don't ask I will point out any blatant, pressing repairs that should be made. But I never say "This piano is junk!" And I never judge a piano until I get it apart, inspect it and begin to tune it. If the piano truly is junk, I will tell them the objective issues that are wrong with the piano, not subjective issues such as tone. I started this thread because I have honestly never tuned a Kimball that sounded very good and I remember my dad jokingly complaining about them as well. I thought perhaps other technicians would share their experiences with them. Just last week I tuned a late 60s / early 70s 6' Kimball grand for a church. I've tuned it before over a year ago and considering the heat isn't always on and it is used every week multiple times a week, the tuning had held pretty well. It was only about 10 cents flat. The overall tone of the piano is pretty good but it has a lot of false beats in the strings. Did I complain to the pastor? Of course not. I tuned the piano and fixed two keys that were not working for free because they are good clients. And then I played a bit for them, got paid, had a nice conversation, and went on my way. I take each piano on a case by case basis. Most of my clientèle are hobbyist or have small children who are just beginning to play. It does't really matter how good or bad the piano is in those instances. But I recently had a new client who was purchasing a used piano and had to decide between two consoles. After hearing her play and learning her background, I steered her towards the more expensive option because I knew she'd be happier in the long run. And so far so good. We deal with what we get! I hope to get a good sounding Kimball one of these days! Last edited by b3groover; 01/26/10 05:16 AM.